We provide affordable search engine optimisation services that get page one results fairly quickly, often within just a few months. We are an SEO agency with over 13 years of experience in the SEO industry. Getting a website on to page one of Google isn’t a dark art, but it does require a level of dedication and expertise to get right. We provide UK SEO services to a range of businesses from Sole traders, small and medium-sized businesses as well as a few international and nationwide companies. 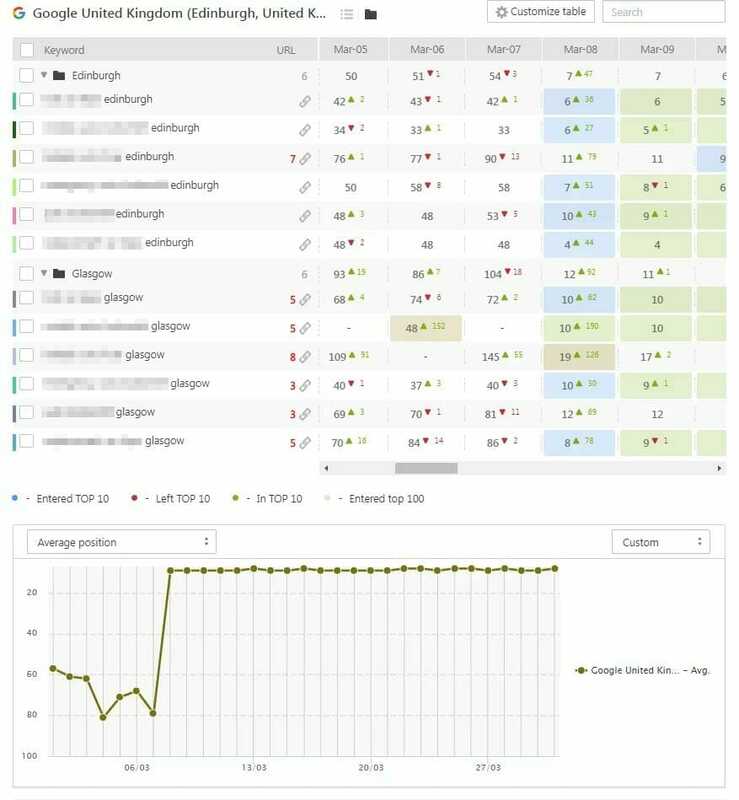 Although we are based and known as an SEO Edinburgh company, we provide our services across Scotland and the UK. We pride ourselves on providing no BS service that gets results for our clients while not breaking the bank in the process. One of the most common questions we get from businesses that are new to internet marketing. Search engine optimisation, or SEO as it’s more commonly referred to, is the process of making strategic updates to a website in order to boost the authority and relevancy for search engines. In order to rank higher on Google, your website must provide enough positive signals like optimised content, code, rich snippets as well as hundreds of other small ranking factors to allow Google’s algorithm to understand what your website is about. This process requires knowledge and experience in order to get the best results in the least amount of time, which is exactly where we come in. At first, we like to run a quick audit of your website to get a rough idea of the position it is in, to begin with. After this, we will sit down with you to discuss your requirements, budget and any expectations that you have. In most cases, once we have all of this information we can start to plan out the strategy that would best work, with rough estimates on the return on your investment and of course, the price to you. Our SEO is a monthly service which we charge via direct debit in most cases, but we are fairly flexible with payment options. We don’t tie any of our clients into long contracts but we do offer them with discounts on the monthly cost – but these are ONLY offered after 2 months to ensure you are happy with the work and progress we are making. Client #1: This small business started with us at the turn of 2017. They had previously used other SEO agencies which had resulted in nothing but a bad experience. We created a bespoke search engine optimisation campaign based on their industry, budget and expectations. Over the course of 6 months, we had progressive increases, leading to a secure page one position in the top 5. Client #2: We started providing services to this Scottish company in February 2017. Within only a few weeks we were able to audit, identify issues, fix said issues and enhance the website’s ranking factors to a point where it secured a page one positions in both cities. This website has since increased further and also expanded into other areas due to success. Client #3: This is another business local to our office came to us in February 2017 having tried and consulted with various other agencies in Scotland with little success. This company had once been on page one but dropped over time. We were tasked with getting their 3 main keywords back into the top 3 on page one, something we accomplished within only 3 months! We perform a full keyword research and audit which is used for our first SEO campaign plan. This process is often repeated every few months to ensure we are targeting the best keywords for your business goals. Using your competitors search marketing activities as a foundation we can tailor your strategy to ensure we have the best chance possible of breaking into Page One, then of course getting to the top. Some SEO Agencies treat link building like a secret task that only they can know about. We take a different approach, we are as transparent as you need us to be. If you want to know why one link is “better” than another then we’re happy to tell you. 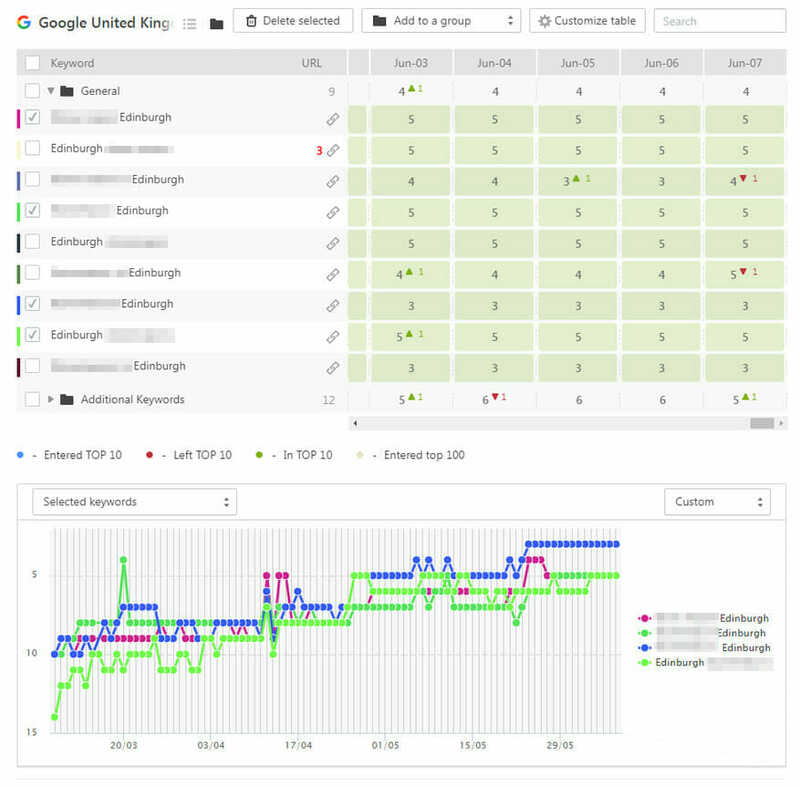 Unlike other SEO agencies, we provide access to tools and reports that give you the latest data in real time. Our daily reporting tools provide most of our clients with the information they need to see that our SEO services are progressing well. Taking a website from nowhere and achieving Page One results on Google isn’t an easy or quick task. In most cases, it takes months of well planned and executed tasks which when combined provide the foundation of a healthy and successful SEO strategy. We are often asked what it takes to get a website to increase it’s organic search engine positions and there isn’t simply a one size fits all answer. Every website is different and every business is looking for different keywords and goals to be achieved. That being said we do rely on some of the same tasks that help all of our clients. The below list isn’t a full list of what we do every month for our clients but it’s certainly a start! We help many businesses around Scotland and the UK so don’t hesitate to get in touch. We only work with one business per set of keywords, to avoid any conflict of interest. Get in touch if you have a requirement for our SEO services.